When jilted Sophie Bowen stumbles into a stone circle filled with fireflies, she wakes up in a very different place—and time. Beaten down by Lincoln’s War and personal tragedy, Gabriel Merritt feels his life has become a lost cause. In a post-war South still licking its wounds, Sophie and Gabriel struggle to understand the place they each find themselves in, while fighting a war of attraction. And a mysterious twelve-year-old girl just might hold the key to it all. 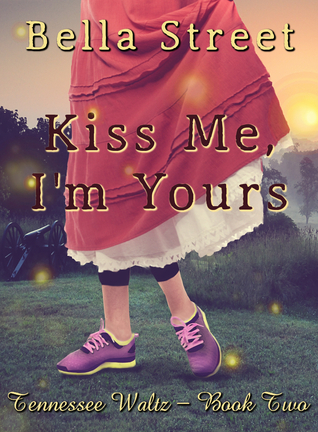 Bella Street’s Tennessee Waltz series where time travel is no obstacle for finding your soul mate continues with KISS ME, I’M YOURS. This time Sophie Bowen, a modern day yoga instructor, finds herself back in the post-civil-war era and not quite believing it. She’s a modern girl used to modern conveniences and finds the life harsh and in many ways cruel. The only comfort she finds is in the GQ model gorgeous farmer, Gabriel Merritt who rescues her and takes her in. Gabriel is a man ahead of his time in his beliefs and ideology, he is a christian man who believes all men are created equal and should be treated with the same respect, which has earned him nothing but shunning and the loss of his position as the local minister. When Sophie suddenly appears, along with an even more mysterious twelve year old girl they call Angela, Gabriel believes fate has sent her for him and quickly falls in love with her, unlike Sophie who takes a little bit of time to accept her new circumstances so she can realize how much Gabriel has come to mean to her. They go through some real serious trials and dangers through which they come to love and depend on each other. Sophie learns what it’s like to be loved and valued by an honestly caring man and realizes just how lucky she was to escape her relationship back in her time with her deadbeat and cheating boyfriend. ~Complimentary copy received in exchange for a honest review. Add to your Goodreads shelf!